9/11 What Really Happened and Why? ROSEMONT, Ill. - It has been over 10 years since the most horrendous and devastating domestic attack in the history of the United States happened September 11, 2001. Over the last decade more questions have been raised than satisfactorily answered about that infamous day involving four high jacked commercial airliners. Two crashed into the Twin Towers of the World Trade Center in New York City, another destroyed a huge section of the Pentagon outside Washington, D.C. and a fourth careened into an open field in Pennsylvania. Nearly 3,000 people were killed. Was 9/11 really carried out by Islamic terrorists or was it an inside job of forces within the U.S.? Why are accredited and accomplished architects, engineers and scientists dismissing the official investigations and reports? Experts argue the impact from jets crashing into the steel enforced towers coupled with intense heat from jet fuel could not have caused the collapse of both buildings. They contend it goes against the laws of physics. Eyewitness accounts from people at Ground Zero, including first responders said they heard explosions before the towers collapsed, another witness reportedly saw a military drone type craft in the sky shortly before Flight 93 crashed in the field. Other key testimonies have not been included in official accounts. These and other questions were recently brought to light at the Nation of Islam’s annual convention. In one of the most intense plenary presentations in the history of Saviours’ Day, “9/11 What Really Happened & Why,” two leading experts on the subject presented documented and verifiable facts they said dispel accounts given by the American government. 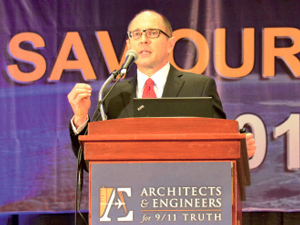 Kevin Ryan, editor of the Journal of 9/11 Studies, and Richard Gage, founder of Architects and Engineers for 9/11 Truth, revealed several important facts and raised critical questions to a packed audience at the Stephen’s Convention Center Feb. 25. “We have come today as a continuation of last year’s Saviours’ Day celebration and observation to focus on scientific analysis. 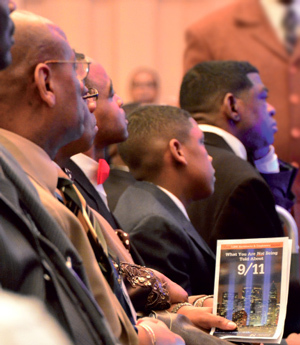 The scientific analysis of some unanswered questions particularly about the events of September 11, 2001,” said Robert Muhammad, Southwest Region student minister of the Nation of Islam who facilitated the session. Robert Muhammad described Mr. Ryan and Mr. Gage as capable, qualified men able to present facts, not hyperbole or “wild conspiracy theories” and to ask questions that need to be answered. “Today, we have to get some answers and we have to what? Connect the dots,” he added. Muslims were immediately blamed for the attacks. Islamic leaders around the world, including the Honorable Minister Louis Farrakhan condemned the attacks and those responsible. The Minister poignantly asked what would make human beings do this? He has repeatedly called for an in-depth look into what happened and the motive behind it. “The official account of the events of September 11, 2001 is a lie,” said Mr. Ryan, a chemistry laboratory manager with 22 years’ experience. “There are many ways to see this. We can begin by stating unequivocally that Muslims did not attack the United States on 9/11. That’s clear from the simple fact that people of God, including Muslims, do not murder innocent people for any reason,” he added. Mr. Ryan pointed out major mainstream media outlets including the London Telegraph and the BBC reported that half of the alleged hijackers were still alive after the attacks. It was also widely reported that the accused hijackers were known to have consumed alcohol and pork and visited strip clubs, said Mr. Ryan. Such acts are divinely prohibited in Islam. These were just a few of the important facts not investigated by the FBI or the U.S. governments 9/11 Commission he pointed out. “We should note that the enemy just happens to live in countries that the U.S. had plans to invade before 9/11. It’s well known and has been admitted by insiders like treasury secretary Paul O’Neill that the Bush administration was planning to invade Iraq from the day they walked into the White House, eight months before 9/11,” said Mr. Ryan. The administration also had plans to invade Afghanistan to build a pipeline he added. “Make no mistake; oil and gas are definitely what the U.S. government values. We need oil and gas to make agricultural chemicals in order to produce food like oils for raw materials for many of the products we use. Not to mention the fuel that drives all of our industry and the U.S. war machine,” said Mr. Ryan who has written several articles and books on the subject of 9/11. “We still need to know who’s behind the 9/11 attack and the one thing we don’t want to do is jump to conclusions again,” said Mr. Ryan. “It might be our own leaders that are the terrorists. People laugh at this idea but it’s a historical fact that the U.S. government plans terrorist attacks against its own people,” he added, citing historical examples like 1960s Operation Northwoods which called for the CIA to commit terrorist acts in America and blame it on Cuba. Richard Gage, a San Francisco area architect with over 24 years of experience represented Architects and Engineers for 9/11 Truth (AE911Truth), a group with over 1,600 members and said everyone needs to know the scientific truths about what happened. Its members and supporters are calling for a new investigation. There are several indications that the Twin Towers were felled by explosives, explained Mr. Gage. The National Institute of Standards and Technology investigated and said there was no evidence of explosives, he added. “Later they acknowledged that they never looked for it. How can you find what you’re not looking for?” Mr. Gage asked the audience. “Fire is an organic process; it has never done what we’re going to see in a moment and it never has brought down a steel-framed high rise or any high rise down to the ground before 9/11,” said Mr. Gage before presenting a detailed slide show and DVD presentation. Though Mr. Ryan and Mr. Gage challenged the government’s official account of what happened both men encouraged the audience to do their own study on the subject and said a deeper investigation is needed. “Please, check out every fact that you hear tonight. We’re not looking for believers. Do your own research,” said Mr. Gage. There are still questions to be answered and a growing number of Americans want answers both men argued. “We brought these brilliant scientific minds to be among us because we want to know the truth. Jesus said ‘Ye shall know the truth and the truth shall set you free.’ We want to be free,” said Robert Muhammad. For additional information visit http://AE911Truth.org. and http://journalof911studies.com. 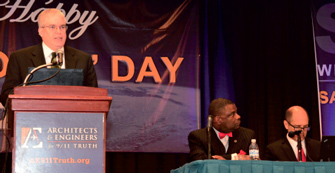 To order a DVD from the Saviours’ Day 2012 plenary on this subject, visit https://store.finalcall.com .